“The computer cordon sanitaire that Chinese authorities are trying to build around China” Wired reported “is called the fanghuo qiang, or “firewall,” a direct translation from English. But a more popular phrase for it is wangguan, literally “NetWall” – a name harking back to an earlier effort to repel foreign invaders. As every Chinese school kid knows, the original Great Wall failed in its basic mission (though it did better as a communication avenue). Will its digital successor fare any better? The PSB’s Comrade X sees both the scope of the problem and the need for what strategists call “defense in depth”: Nationwide regulations are being formulated, but because these will involve so many other laws and areas – advertising, news, and so on – it will be impossible for us to draw up comprehensive legislation in the short term. At the moment it is up to the ISP and the individual to be responsible for the regulation of newsgroups and the leaking of state secrets. Fast-forward to today and China appears to have managed to create an Internet environment that satisfies most of its users, business actors and the Chinese state. With approximately 649 million citizens online, which is almost double the number of users the US currently counts, China has managed to create a parallel (to the global) Internet universe. This universe resembles to the Internet the rest of us enjoy – social networking, e-business, e-government and entertainment services are all at the disposal of Chinese users; in reality, though, this parallel universe is utterly detached from the rest of the digital world. Whether China’s approach to the Internet becomes the new normal is perhaps one of the most crucial questions in modern Internet politics. As governments show an increased interest in the management and administration of the Internet, the question becomes how much the Internet will manage to resist and, in fact, for how long, any degree of governmental intervention. In the end, will it be the Internet that has to adapt to governmental intervention or will it be the other way around? Who will prevail? China has become fully aware that it needs to change and adapt more to the political and economic scene of the 21st century. As it emerges strongly in international fora, it needs to be seen more amenable to adaptation, especially if it is to become a significant and influential player; at the same time, internally, it is important that it continues to be regarded as a state of welfare and prosperity looking out for the best interests of its citizens. What this means is that, at its core, China is not willing to adapt at all costs – preserving an environment of control and harmony continues to be its main ideological driver. The Internet, inevitably, poses significant challenges to this approach: it is open, it is based on a distributed architecture and, it is recognizes no physical boundaries. It is highly interoperable. It is, by its nature, difficult to be controlled or contained. In a nutshell, the Internet requires China to be more efficient and inventive at being authoritarian. This is the online blueprint of what scholars call “adaptive authoritarianism”. In short, “adaptive authoritarianism” refers to the ability of the China Communist Party (CCP) to adapt to an ever-changing environment in order to generate system stability and regime legitimacy. For China, the Internet creates a faux sense of entitlement where the government seeks to preserve its sovereign-based rights through a medium that consciously rejects physical bundaries. “There have been earlier campaigns to control the Internet in China, but they were halfhearted” Yang Guobin, a professor at the Annenberg School of Communication at the University of Pennsylvania told TIME Magazine. “What we are seeing now is a large scale offensive that’s comprehensive and well coordinated”. Currently, the Chinese government has implemented new rules that oblige Chinese users to identify themselves on social media rather than seek to hide their ideas behind aliases. In an effort to control the narrative, anyone with posts shared by more than 500 people can theoretically be thrown to jail for up to three years for “online rumor mongering”. Over the past year, email services, like Gmail or Microsoft’s Outlook have been subject to either total blocking or hacking. And, the past few years, are replete with examples where China has imposed “it is either our way or no way” rules on various tech companies from the west. Lu Wei, China’s Internet czar and head of the Cyberspace Affairs Administration has put this ideological notion in the following context: “The Internet is like a car. If it has no breaks, it doesn’t matter how fast the car is capable of traveling. Once it gets on the highway, you can imagine what the end result is going to be”. This approach sees China establishing a paradigm – we can refer to it as the “new normal” of Internet policy; this “new normal” wants to ensure that the Internet’s power is restricted whilst its potential remains as much realized as possible. But, there is one significant hurdle – the Internet is a technology based on rules which are more consistent with ideas of openness and opportunity. The idea is that entry to the Internet is open and accessible to everyone – the Internet does not recognize rich or poor, authoritative or non-authoritative; it only recognizes creative and innovative ideas and it does so without requiring any permission. By now, we all know that we live in a world of information abundance and the proliferation of ideas. Through mobile devices, tables, laptops and computers we can access and create any sort of data in a ubiquitous way. But, it was not always like that. Before the Internet, information was limited and was traveling slow. Our ancestors depended on channels of information that were often subjected to various policy and regulatory restrictions. The Internet changed all that. Suddenly everything became possible; everyone had the same opportunities to become a creator or publisher of ideas; the Internet has contributed to social empowerment and economic growth. But, have we ever stood long enough to consider what makes the Internet such a special invention? What is it that makes the Internet such an ‘intimidating’ tool for governments like the Chinese one? In short – it is “permissionless innovation”. Vint Cerf, one of the fathers of the Internet who originally coined the term, has argued that permissionless innovation is responsible for the economic benefits of the Internet. But, “permissionless innovation” goes far beyond that. Based on openness, the Internet gives the opportunity to entrepreneurs, creators and inventors to try new business models, to test new ideas and to become empowered without necessarily asking permission from any single person or authority. In this context, “permissionless innovation” is about experimentation and exploring the limits of human imagination. It is about allowing people to think, to create, to build, to construct, to structure and to assemble any idea, thought or theory and turn it into the new Google, Facebook, Spotify or Netflix; or even into a powerful blog or political establishment. As Adam Thierer says in his book Permissionless Innovation: The Continuing Case for Technological Freedom: “Permissionless innovation is about the creativity of the human mind to run wild in its inherent curiosity and inventiveness. In a word, permissionless innovation is about freedom”. Freedom, not anarchy. Leslie Daigle eloquently placed into context the freedom aspect when she described permissionless innovation as “not about fomenting disruption outside the bounds of appropriate behavior: “permissionless” is a guideline for fostering innovation by removing barriers to entry”. Freedom, however, is a word that does not resonate well with the Chinese state. It is a word that encourages disobedience and can create internal conflict. From this perspective of empowering people to express themselves freely and openly, the Internet is not only a disruptive technology, it is actually a dangerous one. As the Wall Street Journal reported, China is addressing this by putting forward rules that essentially “embed cybersecurity police units at major Internet companies and websites to help prevent crimes such as fraud and spreading of rumors”. The revelations by Edward Snowden, that shook the Internet world in 2014, provided the Chinese government with the justification – and to some degree the legitimacy – to push forward with their cyber-sovereign policy. China’s response to these revelations was simple and effective: centralize Internet policy in order to increase order and process and, do so through two main high-level organs. The first of these entities is the Communist Party “Central Leading Group for Cyberspace Affairs”, which is responsible for “drafting national strategies, development plans and major policies”; in parallel, the State Internet Information Office’s main responsibility is to promulgate these policies to low-ranking ministries. Cyber-sovereignty is currently forming China’s main strategy on Internet governance. At a speech before Brazil’s National Congress in July 2014, President Xi stated that “Internet technologies must not be used to violate cyber-sovereignty”. And, during the inaugural World Internet Congress, hosted by China, Xi invited other countries to develop an Internet that would respect cyber-sovereignty and uphold cybersecurity. According to Chinese media, President Xi’s approach on cyber-sovereignty “has two levels of significance: an internal component where each government has the right to develop, regulate, and manage its domestic Internet in line with its national independent autonomy; and, an external component involving the right to defend its Internet from foreign intrusion and attack”. Foucault believes that the “art of government, instead of seeking to found itself in transcendental rules, a cosmological model, or a philosophico-moral ideal, must find the principles of its rationality in that which constitutes the specific reality of the state”. In applying this very rationale, China’s recent WSIS+10 Review submission is consistent with its cyber-sovereignty dialectic. In suggesting how to improve Internet governance, China recommended the establishment of a “multilateral, democratic, and transparent international Internet governance system that ensures equal participation of all, reasonable allocation of Internet resources, and joint management of key Internet infrastructure”. It recognized the need for respect of “a multistakeholder governance model that brings together governments, the private sector and non-governmental organizations […], all of which contribute in their own distinct way to the join governance of the Internet”. At the same time, however, China emphasized that “this [multistakeholder] model should not be lopsided, and any tendency to place sole emphasis on the role of businesses and non-governmental organizations while marginalizing governments should be avoided, the roles and responsibilities of national governments in regard to regulation and security of the network should be upheld. It is necessary to ensure that the United Nations plays a facilitating role in setting up international public policies pertaining to the Internet”. China’s approach on Internet governance is neither new nor surprising. China has never hidden its strong objection to the multistakeholder model of Internet governance – at least the one that sees public policy being created and shaped by the collective efforts of all stakeholders. In fact, in 2010, “ a frustrated China publicly expressed opposition to the renewal of the [Internet Governance Forum] after its initial five-year mandate expired […]”. Although China’s position with respect to the IGF has since then shifted, it still continues to argue strongly for a purely multilateral model of Internet governance. Nevertheless, China has yet to argue convincingly how its multilateral approach improves upon the accepted open, inclusive and multi-participatory model of Internet governance. At the same time, it has also failed to address how the impact of its cyber-sovereignty approach affects issues of speech, content or Internet development. Notwithstanding its weak foundation, the fact is that cyber-sovereignty is central to China’s international engagement strategy and, with China emerging as a powerful player in international politics, we should start asking what is the degree of pressure this approach is placing on the principles of openness, transparency and inclusiveness emanating from the multistakeholder Internet model. China’s push for a cyber-sovereignty strategy at a global level conceals one, much more fundamental issue that goes far deep into the Internet’s core values – both technical and otherwise: it demonstrates an under-appreciation for the Internet and what it stands for. Consequently, this becomes apparent both in China’s approach on public policy issues as well as its vision towards innovation. The fact that China is consolidating its rule-making in entities like the Central Leading Group for Cyberspace Affairs and the State Internet Information Office signals a significant change from China’s previous patchwork towards a more coordinated approach. With laws that strengthen the blocking of Virtual Private Networks (VPN), the ‘real name’ policy and consistent strict censorship rules, China starts demanding from the international community to respect its domestic vision. It is in this context that the blocking of various popular websites should be seen. “China has always been hospitable to the outside world, but I can choose who will be a guest in my home” Lu has argued, emphasizing that the Internet controls imposed by the government are meant to protect national security and the “interests of the Chinese consumers”. “For those firms who want to enter China, there is a basic rule for them – they must abide by Chinese laws and regulations”, he concluded. China’s attitude towards the Internet creates a fascinating oxymoron and poses a fundamental question. How can the Chinese vision contribute and survive in a system that knows no boundaries and was originally designed in a way to facilitate seamless, anonymous communications. The Internet is an open platform, where innovation and creativity proliferate. As mentioned above, one of the Internet’s most valuable properties is “permissionless innovation”. For China, the Internet’s unique properties – what Leslie Daigle calls the “internet invariants” — challenge and create obstacles to the way it normally does its business. But, at the same time, China, like the rest of the world, is fascinated by its incredible potential in particular for commerce and business. To this end, it tries very hard to take advantage of some of its attributes without having to surrender its own values. This is one of the main reasons we get to see such increased control through both regulation and technology. To the extent that it is able to, China intervenes to ensure that the Internet is only a tool for specific purposes driven by the government. Only recently it released a policy document, entitled “Policy interpretation of social operation to regulate domain name registration market”, through which it seeks to “regulate and clean the violations of laws and regulations such as providing domain name registration services without license or beyond the permissible scope, failing to meet the requirements of real-name registration of domain names and adopting improper means like fraud and coercion to sell domain names”. Will this approach ultimately be detrimental to how China and its users end up experiencing the Internet? There is really no straightforward answer to this question. Over the past number of years, governments have become savvier in the way they understand the Internet and the way they want to have a say in how it is managed. As we have seen, China is leading this approach. But, what is the true impact of it? The first immediate one is on innovation. Chinese users may be streaming on Sohu, use Baidu’s search engine, buy flight tickets on Ctrip and learn the latest shenanigans of popular actor Yao Chen through Weibo, but all these platforms are replicas of Google, Expedia and Twitter. Unlike its western counterparts, China does not demonstrate any entrepreneurialism or forward-thinking in terms of the tools, services or platforms that run through the Internet. The idea that the open standards the Internet is built on allow any geek with a computer to innovate and become creative is not prevalent in the Chinese society that seeks to restrict any notion of freedom and openness. This poses a big challenge for China, which wishes to control the evolution of the Internet and to the ability of Chinese to innovate. “There is a longer-term concern about innovation” said Adam Segal, senior fellow for China Studies and the director of the Digital and Cyberspace Policy Program at the Council on Foreign Relations. “A majority of the people who are affected by blocked access to Github, Google Scholar, Google Docs and other restricted services have been the country’s scientists, tech professional and other academics, creating roadblocks for development. There has been discussion within China that this will have a long-term effect on the Chinese economy”, he continued. Additionally, this approach has a real impact on society. The truth is that average Chinese users have the sense that the Internet looks fine. But, this is a faux sense that is provided by the government based on the idea of feeding Chinese users with tools and services that quench their thirst but do not allow them to think. And, overall, this approach works fine. “For many Chinese, the Internet behind the Great Firewall works just fine, delivering goods, series and cat videos with a swipe of a smartphone. If a user sticks to Chinese sites, the speed can be plenty fast and the price for Internet access cheaper than in the US.” Through tight censorship laws and regulations, the Chinese government continues its role as the thought police and does not let users use the Internet to shape and form opinions. As the New York Times reported, for instance, during the Hong Kong protests last year, “words such as “Hong Kong”, “barricades” and “Occupy Central”, the putative name for the civil disobedience campaign, were either blocked or yielded few results on Weibo. Sina has also neutralized the word “umbrella”. […] the government’s propaganda has maintained an iron grip on traditional news outlets, and the majority of Chinese newspapers have ignored the protests”. Now, the question becomes whether the Internet’s forceful nature will manage to supersede the cyber-sovereignty of China’s approach; whether the Internet will ultimately continue to challenge the Chinese government and whether its technology will reach a state where China can no longer control it. For the time being, China seems to have a good grip of it – it manages to satisfy the majority of its citizens although it censors most – if not all – of their ability to speak, share and express. And, more importantly, it does so not at a significant cost to its economy and society. ABOUT THE AUTHOR: Konstantinos Komaitis is a Senior Policy Advisor at the Internet Society and has a wide experience on issues of digital content, innovation, intellectual property and Internet governance. Between 2006-2012, Konstantinos held a Senior Lecturer position at the University of Strathclyde in Glasgow, UK. 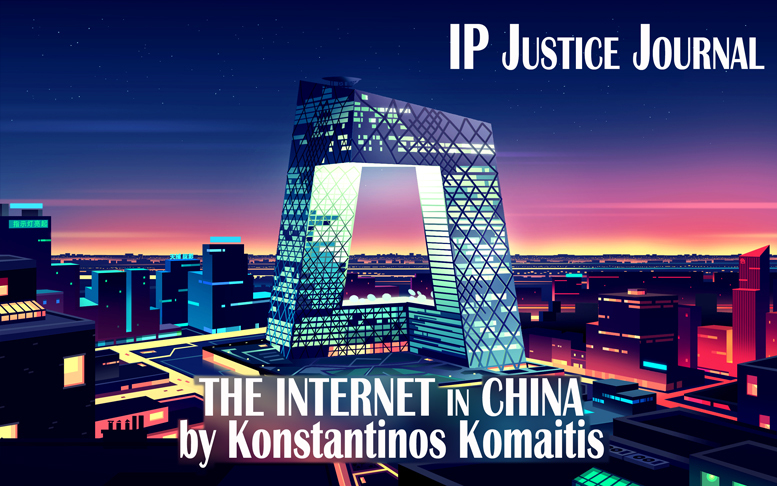 Konstantinos holds a PhD in Law and his thesis focused on issues of intellectual property and the Internet, with particular focus on the intersection of trademarks and domain names. 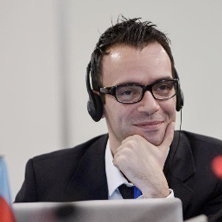 Between 2010-2012, Konstantinos served as the Chair of the Non-Commercial Users Constituency at ICANN and he was a member of ICANN’s Special Trademark Issues (STI) team, which drafted the recommendations for the rights protection mechanisms for new gTLDs. He also serves as a domain name panelist for the Czech Arbitration Court and he is a member of the Research Advisory Committee of the Global Commission on Internet governance. He is the author of the book “The Current State of Domain Name Regulation”. China and Global Internet Governance: A Tiger by the Tail, Milton L. Mueller…..
** Article artwork background from ‘Romain Trystram – CCTV in Beijing‘ licensed via Creative Commons (Attribution 2.0).